After completing the trek through the windy streets uphill, you arrive to Mt. Olympus, a great small open space in a residential neighborhood that houses a breath-taking obelisk. Mt. 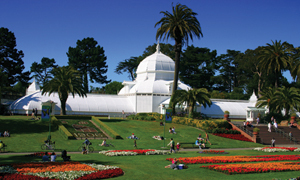 Olympus is owned by the San Francisco Recreation and Park Department. 33-Stanyan -- Ashbury St. and Clifford Terrace. Walk west along Clifford Terrace (it's uphill) to Upper Terrace, then go left (south). At some point along Upper Terrace, you will have the decision to either bear to the right or stay straight. Either way, you will end up at Mt. Olympus. 37-Corbett -- Roosevelt Way and Clifford Terrace. Walk east along Clifford Terrace (it's uphill) to Upper Terrace, then go right (south). At some point along Upper Terrace, you will have the decision to either bear to the right or stay straight. Either way, you will end up at Mt. Olympus.